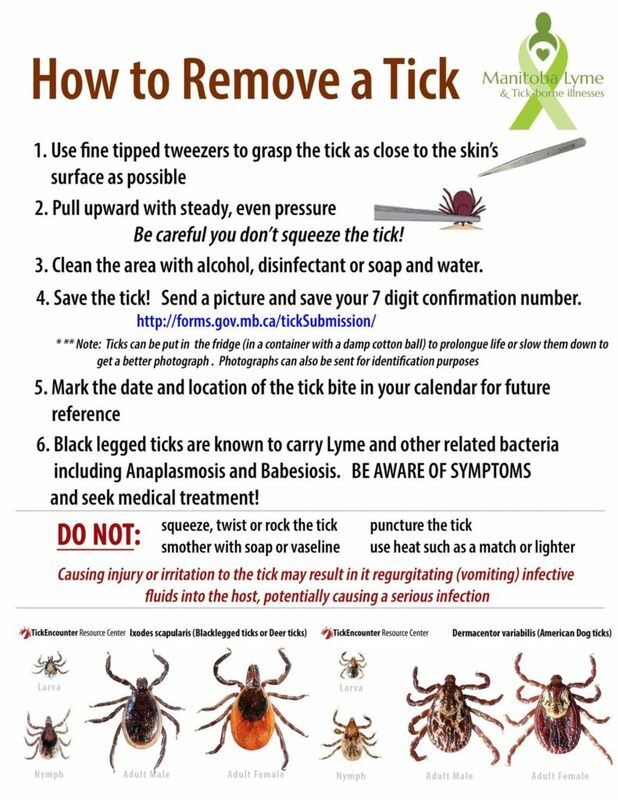 Tick season is here! So here is Ticks 101. The best description that I’ve ever heard is that ticks are little walking bags of pathogens. A more scientific description is that they are a little 8 legged parasitic arachnids that feed off the blood of a host. Hosts include mammals, birds, reptiles, amphibians, and search and rescue volunteers. Knowing that a tick is an arachnid, and not an insect is important. Regular insect repellents and insecticides don’t work on arachnids. Ticks often start to make their appearance in May. Last year it started in April. They start to show up when the weather reaches about +4C. Ticks can move around large areas by hitching rides on migrating birds. Ticks are most active in spring and fall, but can be found year round depending on weather and the host. (If you feel like nightmares, Google ticks and moose.) The most common tick in Saskatchewan is the American Dog tick. There are also some areas that have Rocky Mountain ticks and the Winter ticks (moose tick). These little guys range in size from a little poppy seed to the size of a grape when they’re engorged from feeding. Fortunately they don’t carry Lyme disease, but they do carry other diseases. 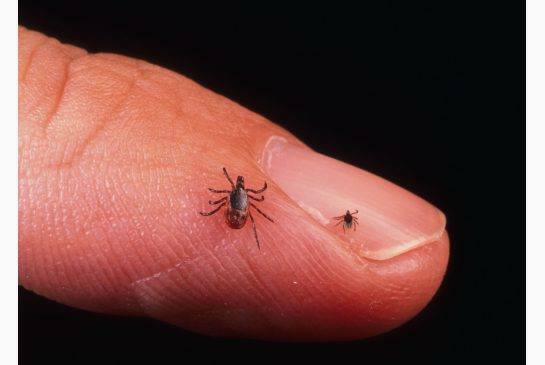 Black Legged ticks that carry Lyme disease are pretty rare in Saskatchewan. They have been found here though, and there have been cases of Lyme disease in Saskatchewan. Ticks move by crawling and running, but do not leap or fly. They love to hang out in tall grass and brush. Ticks cling to grasses, and then grab on to hosts as they walk by. They find hosts by smell, so they can tell that we’re coming. When we’re out on a search, we tend to be extra desirable to them because we’re all hot, sweaty, and exhaling lots of carbon dioxide. After they’ve found their host, they look for a good place to attach, and bite their host. Good news is that it can take anywhere from 10 minutes to 2 hours to attach. Also good news is that disease transmission normally doesn’t occur instantaneously when they bite. It can take 6-8 hours for disease transmission to happen, but more often it’s about 24 hours. 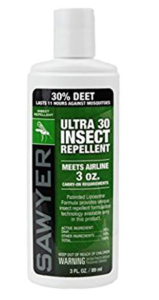 – The international travel clinic and the CDC also recommend applying a Permethrin insecticide designed for clothing and other gear for greater protection. *** Caution. Use it only as directed!!! – It is not recommended to pick up insecticide designed for use in home and gardens. The concentrations are different, plus there are additional chemicals that are not meant for human contact. – Do not use tick collars made for dogs. These are very hazardous to your skin. Dogs have a fur coat to protect them, people don’t. – Do not use around cats. Permethrin is highly toxic to cats. I spray my gear in the garage, and do not bring it into the house until it’s completely dry. Even then, I bag it up so that my cats can’t reach it. This is why you can’t find tick collars or treatments for cats. Okay, so you’ve taken all of these precautions, but you still might have ticks on you. Here is where the most critical and last line of defence is. The tick check! Throughout the search, do quick tick checks on yourself and team members. I often see them crawling up someone’s back, headed for the collar where they can sneak in underneath the shirt. Simply flick them off and keep going. At the end of the day, you must do a very thorough tick check. – Comb out your hair, check behind your ears, your armpits, between your toes, bellybutton, and other rather personal areas. This is where you might need to find someone that you really trust to help you check the parts that you can’t see. It’s important to know that ticks can survive the freezer, submersion, and can live a long time without feeding. I’ve found one in my hair after showering. I’ve also sorted through my gear the next day and found ticks crawling in my “checked” gear. They’re tricky little guys. 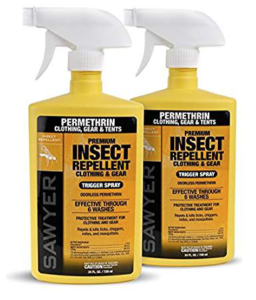 (This is why I’ve started using Permethrin on my gear.) Basically, you have to put your gear through a hot dryer cycle to kill them. For the gear that you can’t put in the dryer, do a very thorough check. Also, check your car and go through it with a lint brush if you drove it. So now you’re done all of the prevention that you can! However… you still find one attached. Once you’ve finished using some profane language, it’s time to remove the tick. – Do NOT just grab onto the largest part of the body, as this squishes the contents of the tick into the wound. – Do NOT force it to back out by using Vaseline, nail polish remover, matches, etc., as it will regurgitate bacteria and disease into the wound. – Using fine tooth tweezers, grasp the tick as close to your skin as possible, and then firmly pull it up and out. A tick key also works. Watch for signs of illness, and go to your doctor if you develop a rash, fever, or other symptoms (check the CDC website). Symptoms can sometimes take weeks to show. It’s also important to note that less than 10% of people who get Lyme disease developed a bulls eye rash. Okay, so I’ve finished my novel.